Why would an andro-morphic, autonomous robotic mechanism follow a dynamically unstable posture as snake creeps down..an appearing body-form of the Yang Family and Chen Man-ching Yang Tai-Chi-exercise unless said robot was not programmed to adapt and delete ineffecient martial motions? Obviously you have some objections with this particular posture. That is an entirely valid opinion, and you may well be correct. But from a scientific perspective, I must ask can you justify, prove, or provide any evidence to back up your opinion? I am pretty confident the rigourous research that you would need to do so does not exist. 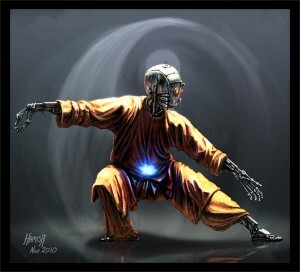 It is my supposition in this blog, that having to program a robot to do tai chi, would be a way forward. It would be a means to get out of the "opinion impasse", and provide scientifically valid data and test cases to indisputably show what is efficient and what is not.